This article is about the former baseball player. For his son and current player, see Fernando Tatís Jr.
Fernando Gabriel Tatís Sr. (born January 1, 1975) is a Dominican former professional baseball third baseman, and a current manager in Minor League Baseball. Over his 11-year Major League Baseball (MLB) career, he played for the Texas Rangers, St. Louis Cardinals, Montreal Expos, Baltimore Orioles, and the New York Mets. Tatis holds the major league record for RBIs in an inning, a feat that he achieved by hitting two grand slam home runs in one inning during a game on April 23, 1999, becoming the only player in MLB history ever to do so. Tatís had the best season of his career in 1999 with the St. Louis Cardinals. He hit 34 home runs with 107 RBIs and 21 stolen bases, with a .298 batting average. On April 23, 1999, Tatís made baseball history when he hit two grand slams in one inning. He is the only batter in MLB history to accomplish this feat. Tatís hit both of his grand slams against the pitcher Chan Ho Park of the Los Angeles Dodgers. With these home runs Tatís also set a Major League record with eight runs batted in during a single inning. On May 28, Tatís hit a walk-off double against Justin Miller to defeat the Florida Marlins in the bottom of the 12th inning. This was Tatís's first career walk-off hit. 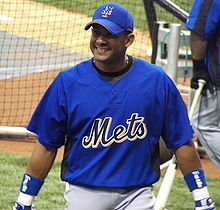 Tatís played most of his time with the Mets in left field and right field because of injuries to the usual starters Moisés Alou and Ryan Church. Tatís' father, Fernando Aanonio Tatís, was also a professional baseball player. He was an infielder in the Houston Astros system from 1969 through 1978, reaching as high as Class AAA before retiring and moving on to coaching and scouting Houston's minor leaguers. The elder Tatís disappeared from Fernando's life when he was four years old. The two were not reunited until 1997 when the younger Tatís was a rookie with the Texas Rangers. Rangers scout Omar Minaya, who Tatís described as a father figure, helped to discover that his father was residing in Sarasota, Florida. Tatís's son, Fernando Tatís Jr., is a shortstop for the San Diego Padres. ^ "St. Louis Cardinals 12, Los Angeles Dodgers 5". Retrosheet. April 23, 1999. Retrieved January 12, 2019. ^ "Two grand slams in a game". MLB.com. Retrieved January 12, 2019. ^ "RBI Records / Runs Batted in Records". Baseball Almanac. Retrieved January 12, 2019. ^ DiComo, Anthony (July 28, 2008). "For want of a church, Tatis reborn". MLB.com. Retrieved August 13, 2008. ^ "Orioles purchase contract of 3B Tatis from minors". SportsTicker. July 21, 2006. Retrieved August 13, 2008. ^ Hubbuch, Bart (May 11, 2008). "Santana gets OK to start vs. Yankees". New York Post. Retrieved August 13, 2008. ^ "Marlins homer to take lead, but Tatis' double lifts Mets in 12th". Associated Press. May 28, 2008. Retrieved August 13, 2008. ^ "Red Sox announce minor league field staffs for 2018". MLB.com. January 9, 2018. Retrieved January 10, 2018. ^ Berardino, Mike (March 3, 2002). "`Father Figure' Helped Tatis Find His Real Dad". Orlando Sentinel. Retrieved May 6, 2015. ^ "Tatis Jr. among White Sox finds on int'l market". MLB.com. Retrieved July 2, 2015. This page was last edited on 9 April 2019, at 00:23 (UTC).